NEWARK, N.J. -- With Zach Bogosian and Matt Hunwick both absent from practice Sunday in Prudential Center, the Buffalo Sabres recalled defenseman Lawrence Pilut from Rochester. Pilut, a 23-year-old defenseman, joined the team as a precaution because Bogosian and Hunwick are dealing with injuries. 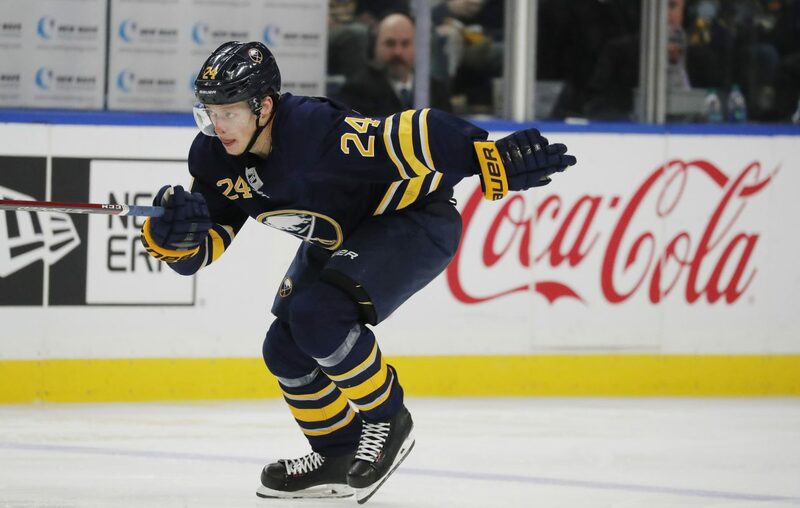 However, it remains unclear if Pilut will be needed when the Sabres play the New Jersey Devils on Monday at 7 p.m.
Buffalo coach Phil Housley said Bogosian is expected to be available against the Devils, and Pilut's arrival was simply a precaution because Hunwick has missed three consecutive games with an upper-body injury. "We’re sort of depleted with Matt Hunwick’s situation as well," Housley said following practice. "We felt we needed some insurance and those decisions will be made at game time tomorrow." Bogosian has been dealing with a lower-body injury and regularly has sat out practice the last couple of weeks. He played 19 minutes, 18 seconds in Saturday's 7-4 loss at Montreal and is averaging 21 minutes, 38 seconds in 65 games this season. The Sabres also are without defenseman Jake McCabe, whose season ended earlier this month because of an upper-body injury, and the team had only six available defensemen with Hunwick day-to-day. Pilut was a natural fit for a recall despite the Amerks trying to improve their playoff position. Pilut had one goal with six assists and a minus-3 rating in 25 games for the Sabres earlier this season. He was sent down because of recurring defensive lapses, but the rookie was able to make an impact with the puck on his stick. He has four goals and 22 assists in 28 games for the Amerks, with a plus-21 rating and .93 points per game ratio that both rank second among Rochester skaters. Still, Pilut has been displeased with his play since returning to Rochester. "I think I had great consistency in the beginning of the season, and I went back and struggled a little bit," Pilut said. "I'm finding my way back slowly. I thought yesterday was a good game for me. That somehow gave me a little push." Pilut was referring to his performance in the Amerks' 5-2 victory over the Toronto Marlies Saturday night, when he had four shots on goal and a plus-1 rating. Despite bouts of inconsistency, the Sabres had a 51.15 percent 5-on-5 shot differential with Pilut on the ice this season, which ranks second behind Rasmus Dahlin among the team's defensemen. The Sabres signed Pilut to an entry-level contract in May and he was recalled by Buffalo after he was tied for the AHL lead with 22 points through 15 games with the Amerks. A left-shot defenseman, Pilut will be a restricted free agent after next season. "I try to learn from the bad things and keep the good things in mind," Pilut said of his first stint with the Sabres. "I just want to keep working on my consistency out there and just try to play as good as I can. That's what I have on my mind right now." Sabres rookie center Casey Mittelstadt filled in on defense with Pilut a late arrival and could be a healthy scratch Monday against the Devils despite assisting on Sam Reinhart's first-period goal against Montreal. Mittelstadt, 20, has 11 goals with 12 assists and a minus-15 rating in 70 games. While his skill has tantalized at times, his defensive awareness has remained inconsistent. Tage Thompson is expected to draw back into the lineup if Mittelstadt sits. "I think Casey’s given us some really good games and sometimes in a player’s development it’s not a bad thing to take a step back," Housley said. "You look at our games, we’re giving up way too much right now. And it’s not what you make, it’s what you leave on the table. Right now we’re leaving way too much. In Casey’s defense, it might be a good thing to just take a deep breath. He’s played a lot of hockey up to this point, so we’ll make that decision tomorrow."